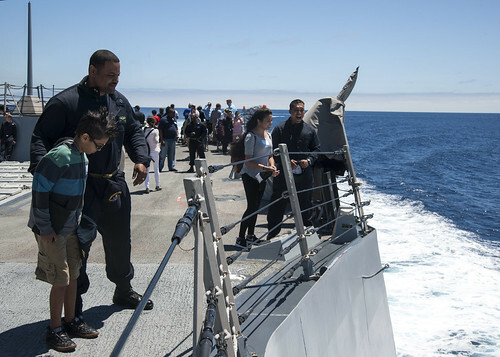 SAN DIEGO – The officers and crew of the guided missile destroyer USS William P. Lawrence (DDG 110) hosted a friends and family day cruise, July 23. The ship hosted the event to give Sailors a chance to showcase their hard work and daily shipboard life to the ones they love the most. Among the ships visiting members was William P. Lawrence Jr., the son of Vice Adm. William P. Lawrence, the ship’s namesake. During the cruise, Sailors and guests enjoyed a full gain demonstration, helicopter flyover and a picnic on the flight deck. Guests also had the opportunity to learn about the crew of William P. Lawrence by viewing informational presentations displayed throughout the ship during the guided tours. "This is my first ship," said Machinist's Mate Fireman Recruit Derek Lemoine. "So this was the first time I brought my family aboard and they were definitely entertained the whole time. I know that they are going to want to come back for the next one." Sailors also treated friends and family members to a cook-out on the ship’s flight deck. "I thought it was fabulous," said Terri Waguespack Lemoine, Fireman Recruit Lemoine’s mother. "The cookout was such a nice touch and it was really nice to see where my son sleeps at night. It was amazing to see how the Navy works and how the destroyer works, we just thoroughly enjoyed it." Friends and family day was not only about showing the guests a good time but also about how William P. Lawrence operates at sea in support of global operations.